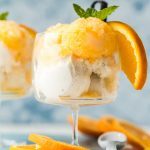 Orange Creamsicle Granita is made with freshly squeezed orange juice, a touch of sugar then frozen and scooped onto vanilla ice cream. 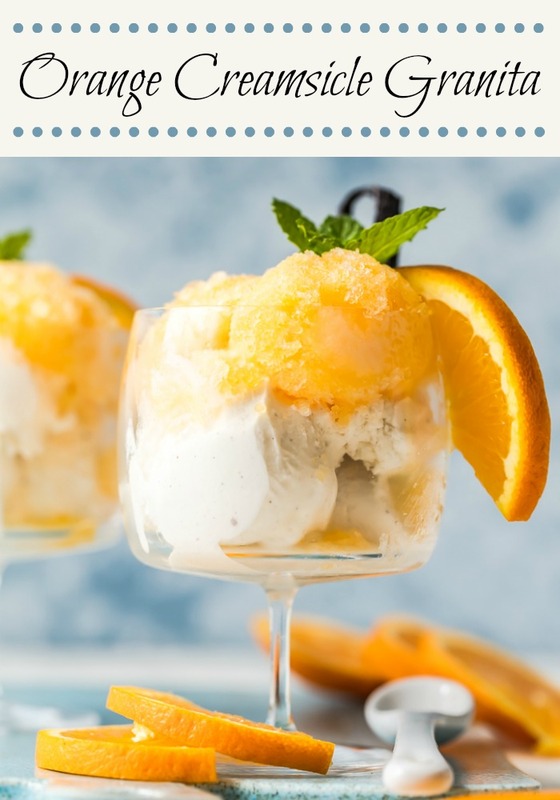 So simple, beautiful, refreshing and so much better than an ice cream truck Orange Creamsicle popsicle. It is a perfect summer dessert. This is a dessert that can be served simply and enjoyed while swinging with your hubby, on the porch, on a warm summer evening. It’s also a dessert that can be adorned with a mint leaf, a fresh orange slice and a vanilla bean to be the star at any white-tie dinner party. 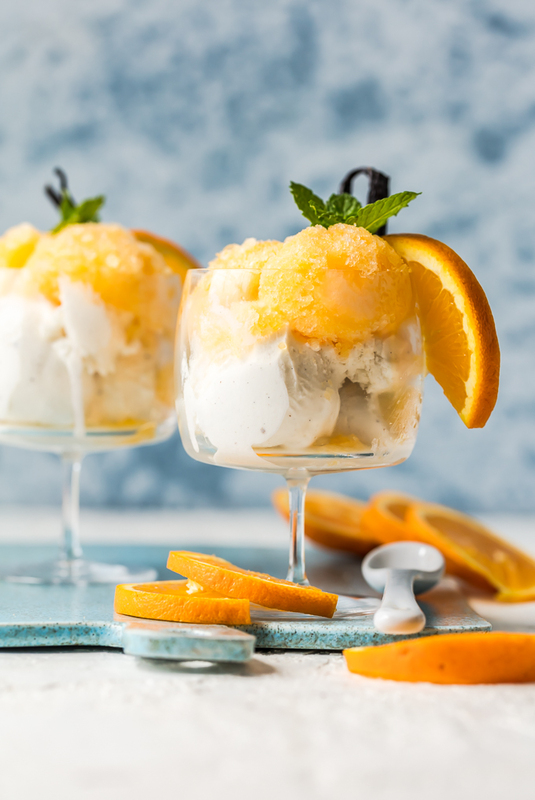 Look closely at this dressed up Orange Creamsicle Granita. You might notice the granita, mint, orange slice and vanilla bean look similar to some of the British women’s fascinators (hats) worn at Prince Harry’s wedding. Drizzle with a favorite liqueur, such as Amaretto, Cointreau or Creme de Cacao. Add a touch of champagne to make a mimosa granita. Use other flavors of ice cream, such as chocolate, black walnut or butter brickle. 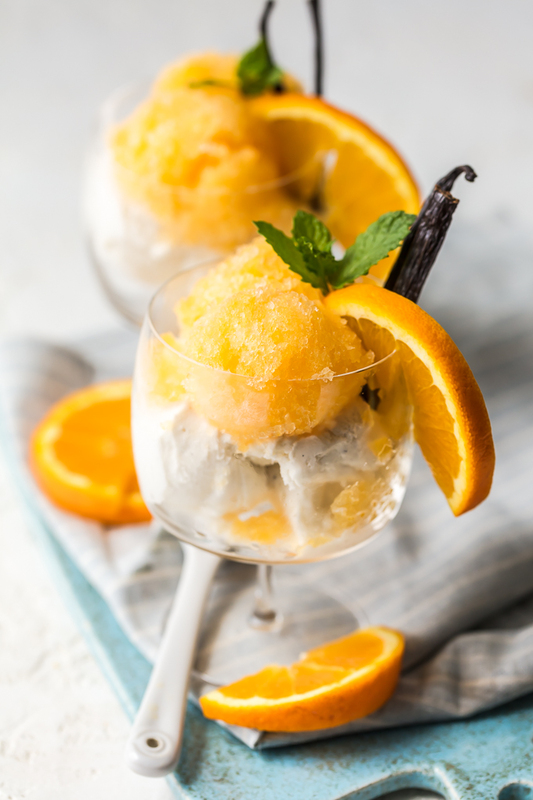 Serve just the Orange Granita in a small dish for a light and refreshing treat. To get the most juice from the oranges, allow the oranges to come to room temperature then press and roll them on the counter before squeezing. Ultra fine granulated sugar is best to use. If ultra fine isn’t available, process regular granulated sugar in a food processor to create a finer grain. If a food processor isn’t available, make a simple syrup (directions in the recipe card). When using ultra fine sugar, the sugar will dissolve quickly and it isn’t necessary to make a simple syrup. Be sure to break the ice crystals up with a fork every hour for the first 4 hours while the granita freezes. Don’t worry if the granita doesn’t hold together well when scooping it out. Have fun with this recipe by substituting other citrus juices, flavors of ice cream and liqueurs. It is best to make the orange granita the day before serving to give it plenty of time to freeze thoroughly. At the very least, allow 6 hours freezing time. If adding liqueur, allow more time for the granita to freeze. Granitas and sorbets are often mistaken for each other, but they are more first cousins than siblings. Their differences are due to the freezing process used for each. Granita is stirred often which results in a slushy texture with larger ice crystals. Sorbet is smooth-churned resulting in a denser and smoother texture. Orange Creamsicle Granita is made with freshly squeezed orange juice, a touch of sugar & vanilla ice cream. So simple, beautiful and refreshing. It's even better than an ice cream truck Creamsicle and the perfect summer dessert. Wash the oranges and squeeze or press the juice from the oranges into a medium-sized bowl. With the back of a small spoon, scrape the inside of the oranges to extract all the juice. Pour and press the juice and pulp through a fine mesh strainer set over another medium-sized serving bowl. Add the sugar and stir until the sugar is dissolved. Stir in the Cointreau, if using. 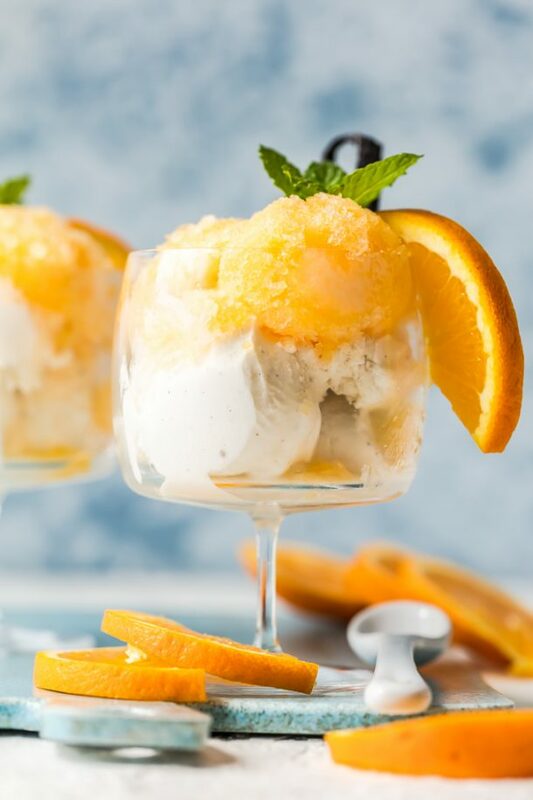 When ready to serve, place 1-2 scoops of ice cream into each serving dish and place a scoop of the frozen orange granita on the top or side of the ice cream. If you want to be fancy, garnish the granita with a mint leaf and an orange slice. Serve immediately. *Note - If ultra fine sugar isn't available, it can be made very easily. Place the amount of granulated sugar needed in a food processor and process the sugar until the crystal size is much finer. Be careful not to over- process the sugar or it will turn to powdered (or confectioner's) sugar. If a food processor isn't available, just make an orange simple syrup using 1/2 cup of the orange juice and 1/4 cup regular granulated sugar. In a small saucepan (set oven medium heat), bring the orange/sugar mixture just to a boil then reduce the heat to low. Stir until the sugar is dissolved completely. Allow the orange simple syrup to cool to room temperature and refrigerate it until cold. 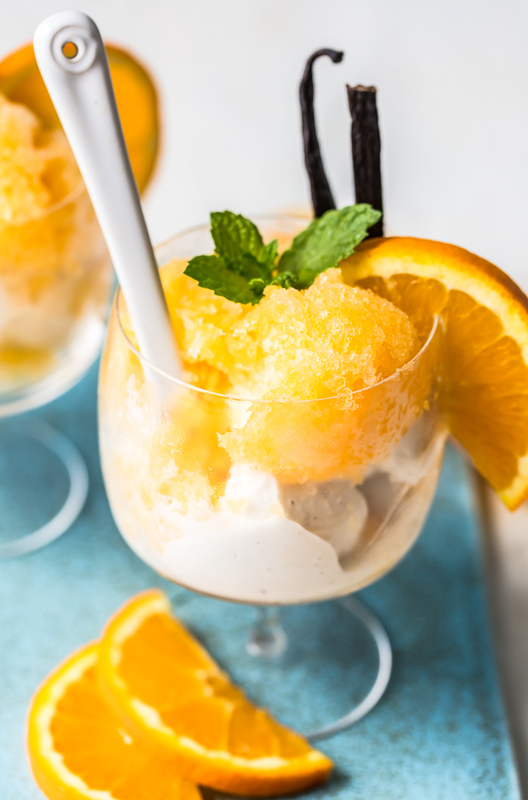 To make the granita, add the cold orange simple simple syrup to the remaining 2-1/2 cups squeezed orange juice, stir well, freeze and follow recipe instructions. Susie, Only you can lure me in with a delicious treat like these gorgeous creamsicles and within a minute have me chuckling and drooling at the same time. I'll likely never be able to look at a mint garnish again and not think of the parade of hats that always appear at royal weddings. Too funny! I'm betting that nothing this pretty or delicious makes it to those head tables. This makes the common folk like us all the luckier! Thanks, once again for such delicious inspiration and the humor; I'm a huge fan of both.